On Tuesday morning 15th November 2016, under gloomy skies, our latest Fungi Walk took place at Ryde Cemetery under the guidance of Dr Colin Pope of the Isle of Wight Natural History and Archaeological Society. 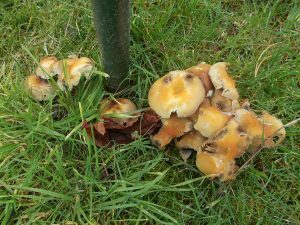 At first because of the recent lack of the preferred growing conditions, a period of warm wet weather, the fungi threatened to be as scarce as the number of walkers but fortunately, although not as good as last year, this proved not to be the case. The smallness of the group allowed better interaction and soon everyone was spotting specimens both poisonous and edible for Dr Pope to identify. Among those found were Fairy ring champignon, Parasol mushroom, Ink cap, Shaggy scalycap, White wax cap, Shaggy ink cap, Field mushroom, Sulphur tuft, Weeping widow, Honey fungus, Butter cap, Blue leg mushroom and Yellow dung head mushroom. One sad note was struck when a beech was found surrounded by Honey Fungus and Dr Pope said that it would eventually result in the death of the tree. Following the walk refreshments were served in the North Chapel where the walkers were joined by RSHG transcribers who had been working that morning.